Vancouver, Jan 29: Leading expedition cruise specialist One Ocean Expeditions (OOE), known for elevating expedition cruise travel to new heights, has built a comprehensive program that delivers experiences that go well beyond tourism. These range from in-depth science, polar history, and education to an exploration of the self in some of the most pristine regions on earth. These experiences nourish the travelers' mind, body, and soul while creating advocates for the health and protection of our oceans and the planet. One Ocean Expeditions’ commitment towards the well-being of the environment and its guests is a priority. With the recent acquisition of a new expedition vessel, RGCS Resolute, OOE passengers have access to modern wellness facilities in a relaxed and spacious atmosphere. There is plenty to choose from both on and off the vessel, including a fully equipped gymnasium, massage room, sauna, steam room, jacuzzi, salt water pool, and panoramic outdoor viewing decks so you can rejuvenate surrounded by extraordinary scenery. In each destination that OOE visits- Antarctica, Canadian Arctic, Norwegian Arctic, Islands of the North Atlantic, Canada’s East Coast, Central and South America- guests have access to an array of activities, excursions and wellness options. Active programming is accessible to people of all ages and fitness levels. This includes yoga classes, sea kayaking, zodiac wildlife cruising and hiking, as well as ski touring, camping and snowshoeing in the polar regions or in warmer climes choose to snorkel, cycle or stand-up paddleboard. OOE’s expert staff and specialty guides bring a wealth of knowledge and experience to the company’s trademark outstanding personalized service. 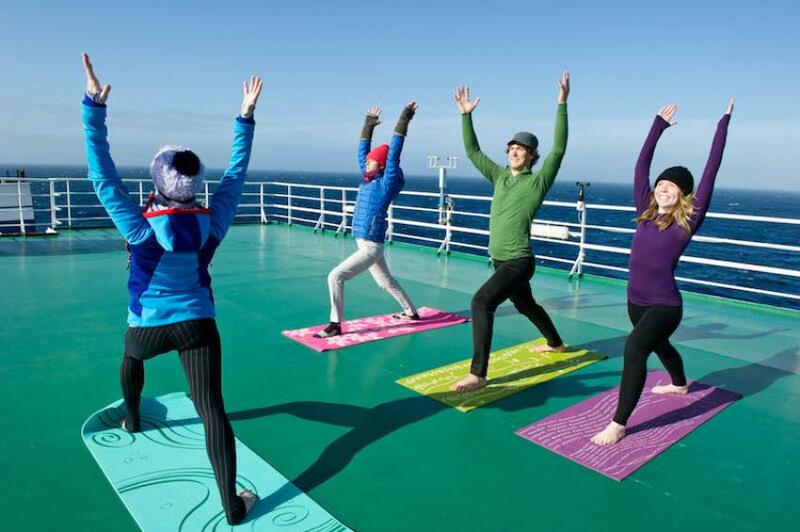 In conjunction with offering premiere amenities and on-going programming while upholding OOE’s unique small ship cruising experience, One Ocean Expeditions will be inviting wellness experts such as yogis, trainers, and local guides to take part in the program. This leadership will help guests develop a deeper relationship to their inner well-being, whether it be a reflection into the mind, guidance through fitness and nutrition, or a connection to the unique environment and destinations visited.